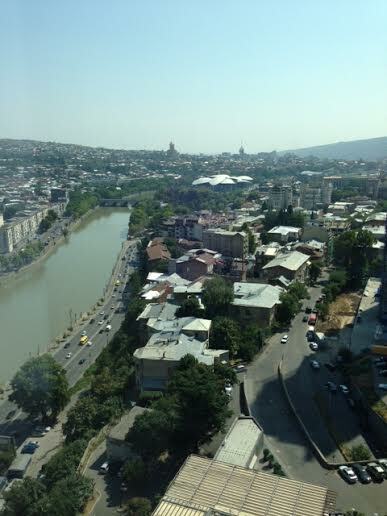 Over Labor Day weekend we welcomed our first visitors – our friend L from law school and her fiance M. L&M were on a whirlwind tour of Georgia and Armenia and spent two days with us in Tbilisi. I do not have a single picture of us together – I don’t know how that happened! I have no excuse. I picked them up at the airport (where a very helpful police officer created a parking spot for me) and drove them back to our place, filling them in on what we’ve learned about Tbilisi so far. The initial plan was for them to take showers and grab a bite to eat before heading downtown to sight see with JR, but they both fell asleep. We warned them that the jet lag is rough! They set off on their own for a few hours while JR and I waited for Abby’s sitter to arrive, and then we met them at a restaurant downtown called In the Shadow of Metekhi. It was our first visit, and a great spot for anyone new to Tbilisi. The traditional Georgian fare was tasty, they had singing and dancing, and a beautiful view of the city at night. On Sunday, the three of them went to the Old Town to explore while I stayed home with Abby. They rode cable car up to the fortress and walked down from there, shopped at the Dry Bridge market and had lunch at a small cafe. They returned while Abby was napping and everyone rested (well, actually I watched Gilmore Girls because I’m kind of obsessed right now). That night we went to Piano, an Italian restaurant for dinner. The food was really good and they had a nice outdoor seating area, but since we were outside guests were smoking and that’s always a negative for me. We’ll definitely go back but we’d probably sit inside next time. On Labor Day L & M left for Kazbegi and other parts of Georgia, while JR and I enjoyed an extra day off at home. I especially enjoyed it because I met at friend at the Radisson Blu Spa for a facial and head massage. It was glorious! 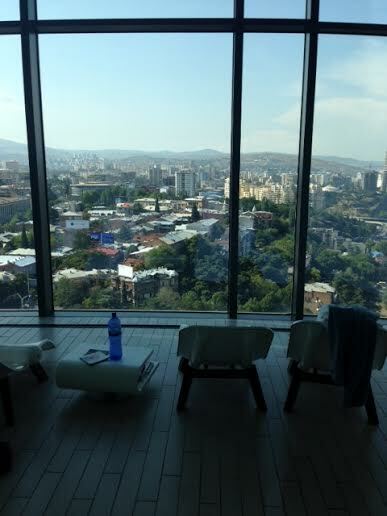 The spa is on the 18th floor and has beautiful views of the city. If you have spa services booked, you can take advantage of the indoor swimming pool, sauna, steam room, and other amenities. It was a perfect way to relax after a busy weekend!